Inland Building Systems is one of the oldest trade names in the metal building industry, coming into existence in 1910 as part of Inland Steel Corporation. Inland was originally headquartered in Deerfield, Illinois. Inland Steel Corporation then merged their metal building company with Ryerson Corporation, and called the new company Inland Ryerson, or INRYCO. Shortly after the merger a decision was made to locate a manufacturing facility in the southeastern United States. With significant assistance and cooperation from the Cullman, Alabama Industrial Development Board, Cullman, Alabama was chosen as the site of the new manufacturing facility. In 1974, Nearen Construction was selected as the contractor and completed the building erection. Inland Building Systems operated from 1974 until 1986 as INRYCO at which time Inland Steel made the decision to divest themselves of the metal building business. The company was purchased in 1986 by a financial group, Dubin and Clark. Since 1985 other changes occurred with Inland’s business structure that has led us to where we are today. In 1993 a private group of investors was formed. The group consisted of highly experienced metal building professionals and private investors established an Alabama corporation and once again with the help of the Cullman, Alabama Industrial Development Board, expanded the facility in Cullman, Alabama to meet the ever growing demand for the Inland product. The organization maintained a steady growth and reached capacity of the facility in four short years. In 1996 Behlen Manufacturing Company, a Columbus, Nebraska company acquired the assets and operated the company until September of 2008 when Schulte Building Systems made an offer to purchase Inland Building Systems. The Schulte name has been known throughout the metal building industry for over half of a century. The Schulte name is synonymous with dedication to strong, loyal customer service and quality engineering and manufacturing in providing the very best metal, most erectable building in the industry. This dedication and loyalty is the benchmark for our effort at Inland Building Systems. 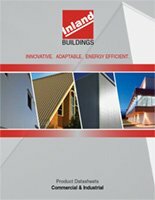 Inland Building Systems has a wonderful history and has an excellent reputation in the industry. By building a world class service organization to blend with the quality product provided by Inland Building Systems the potential of Inland Building Systems is limitless.